You’ll probably agree that the best way to learn about a country is to explore it through all your senses. Whether it’s sightseeing, visiting festivals and listening to local folklore, learning traditional crafts or tasting regional specialities, you’re bound to get something new and exciting. The manor house in Bytča and an adjacent wedding palace have quite a few stories to tell, and a great deal of architectonic features to feast your eyes upon. On top of that, there’s an elegant restaurant with a wine bar right next to the palace – a mystique place steeped in history offering a very authentic dining experience. Once a home of the noble Thurzo family, the manor house was designed by an Italian master builder and completed in 1571. When Juraj Thurzo took over the estate after his mother’s death, he added a beautiful Renaissance building to the family residence. 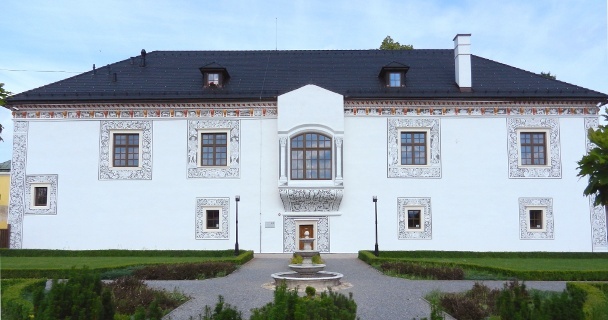 Built in 1601, the wedding palace served representative purposes, as well as a wedding place for Thurzo’s six daughters. Juraj Thurzo was a powerful Hungarian magnate with a strong interest in the arts and sciences, who spoke 5 languages and was appointed the Palatine of Hungary under the reign of King Rudolf II. Much of the palace’s original beauty was lost under the succeeding proprietors, whether it was for careless, incompetent use of the premises or inept restoration. It appears that the latest major repair between 2008 – 2009 has brought this architectural gem closest to its original state – at least that’s what experts say. The palace grounds, including the grand Renaissance gardens, are open to the public all year round. The palace interior can be seen free of charge from Tuesday to Sunday (9am – 5pm). In the spring and summer months there’s a host of events organized both outside and inside the palace, like the traditional food and crafts markets, concerts, educational programmes and, as you might expect, wedding ceremonies for the general public. The heraldic portal above the entrance to the wedding palace. Beautiful Renaissance gardens are all around the palace. The river outside the palace grounds has been a witness to four fires and a few attempts at the palace site’s reconstruction. Of course I couldn’t leave the palace without trying the ‘U palatína’ (At the Palatine’s) restaurant. They offer international cuisine, regional specialities, house desserts and a fair range of salads, altogether with a wide selection of wines from Slovakia and abroad. Yet I was more tempted by their seasonal menu, which featured asparagus in a variety of light, nutritious dishes, so I went for Steamed Asparagus with New Baby Potatoes in Hollandaise Sauce. I had to give it a definite thumbs-up, as the asparagus had been cooked to perfect tenderness and the buttered potatoes melted in my mouth, not to mention the sublime hollandaise sauce. It was exactly what I wished for on this warm spring day – a simple yet satisfying late afternoon meal that would keep me going for the rest of the day. On leaving the restaurant I made a mental note to try and make hollandaise sauce at home while asparagus is still in season.